We all experience fear, even our most popular idols. It’s just a part of being human. And being brave doesn’t mean you’re fearless, it means that you keep moving despite those fears. But whether you have small underlying fears, or big “in your face” type of fears, you’ll never be able to take those steps towards what you want in life unless you identify and confront those fears that are trying to stop you. So instead of steering clear of those fears, stand up and face them. Once you identify them and start to explore them, you’ll find that most of your fears are simply anticipations of a negative outcome. The solution is to simply shift your perception. There is no such thing as failure, only results. If you use these results not as a measure of success or failure, but as a means to continue learning, getting experience, and getting feedback on what works and doesn’t; then you will gain more courage and more momentum to keep moving. #1. Think of it as a place of practice. Use your journal to experiment, try new techniques, or just to see what works and what doesn’t. #2. Don’t be afraid to make mistakes, its only paint! You can always go over it if you need to or try again. #3. Remember that art doesn’t have to be pretty, and it doesn’t have to impress someone. Allow your art to be whatever it wants to be. Just let it flow from you. #4. Get messy! Get messy and just enjoy the process of playing without worrying about what the outcome will be. #5. Always remember that art journaling especially is all about the process. Its about bringing your words, dreams, and thoughts to life, and its about having a place to release your creativity. Hopefully these tips help you see how you can overcome your fears, because if you do have fears about art journaling, then its a good indication that its something you really want to do. 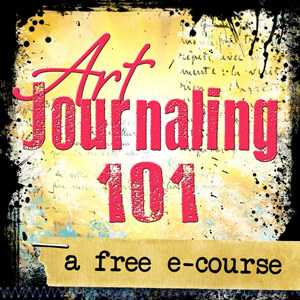 Leave me a comment, and let me know what fears you’ve been facing when you think about working in an art journal. I’d love to hear from you! Kristal, are you in my mind??? these are all my fears in life, I always try to do everything perfect and beautiful and if I’m not sure…some times I don´t even try. I promise to work on this, thanks so much for be an inspiration!!! Ah getting started is the hardest thing for me. I use to not have issues. Then after some major losses in my life art constantly get placed on the back burner cause I need to have a perfect plan and it needs to come out perfect. It truly is a huge block and hindrance in my ability to grow and play with art. I have a ton of supplies and supports but letting myself go and not have to worry about the outcome is hard. I just want my joy I use have back! You don’t happen to have a specific exercise(s) or know of a book that can help with such? You should be my therapist, you know exactly what to say to help quell the fears. Thanks.